Brian Lynch: Look what came today. Check it out. Day after ANGEL:AFTER THE FALL: FIRST NIGHT came, EVERYBODY'S DEAD trade paperback is on my doorstep. I'll post more pictures later. It is beeeeeeautiful. Much thanks to Chris, Ted, Justin, everyone at IDW. And of course, Mr. Crosland. Good stuff, man. I'm looking forward to getting both of those books. Can't wait for this either! It's Lew Zealand! XD I'm sorry, but that deeply amuses me. "I throw the fish, and it comes back to me!" LOL. Don't ever apologize for your love of Lew Zealand. 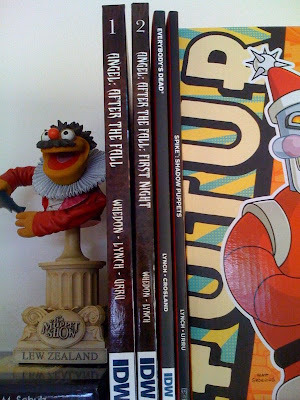 The Muppet script I sold to Henson way-back-when was jam-packed full of Lew Zealand. EVERYBODY'S DEAD trade paperback his Wednesday! ANGEL:AFTER THE FALL #15 in PREVIEWS! Preview for SPIKE:AFTER THE FALL # 3! Just sent in the corrections for SPIKE 4! SPIKE:AFTER THE FALL # 4 finished! Tomorrow! ANGEL:AFTER THE FALL volume 2! First Look: EVERYBODY'S DEAD collected! ANGEL:ATF Volume 2 hardcover September 10th! ANGEL:AFTER THE FALL # 12!